According to the owner this Marshall Super Bass amp was owned by Bo Diddley and was last gigged in 2001 before it was sold to a music store, Mancini Music, GA. 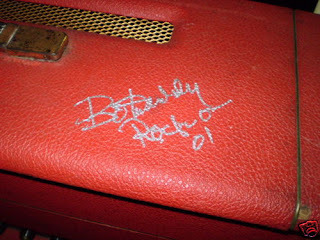 This red 100w Super Bass head and 4 x 12 slant cabinet is apparently from 1969 or 1970, and bears Bo's signature on the head's top. At a Buy It Now of a buck shy of 10 grand, this amp is being priced as an authentic piece formerly owned by a rock n' roll legend and Hall of Famer. But Bo Diddley and other guitarists of his generation used to play on a lot of rental equipment on the road. 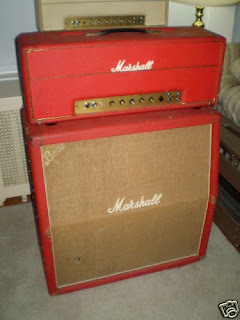 And you don't want to be saddled with what could possibly be just a rental amp that bears his signature. Ask for the necessary letters of provenance before committing. I'm just sayin'..